Georender 3 was published by www.lagoonline.com in 2002. 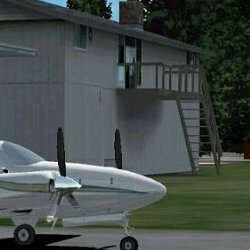 It adds scenery of Diamond Point airfield in the state of Washington to Microsoft Flight Simulator 2002.
: " GeoRender part 3 scenery covers Diamond Point airfield based in the beatiful state of Washington, eight miles North East from Sequim. 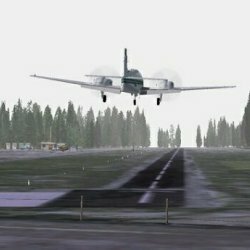 Georender reproduced the atmosphere of this small community of flight enthusiasts in great detail. For all of you out there who dream of such a place you will now have the opportunity to visit it. 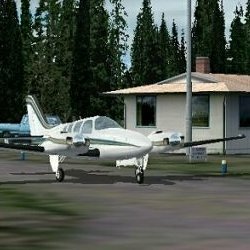 The airfield is surrounded by houses that instead of having garages, have private hangars that connect to the airstrip . The level of detail in this product is staggering. This is the first GeoRender product done in 100% GMax, with the resulting increase in framerates. The scenery has the by now standard Active Scenery tracks (forget about AI traffic) and an enhanced set of sounds that will let you immerse much more into it. Most of the hangars will open when you get close to them. "